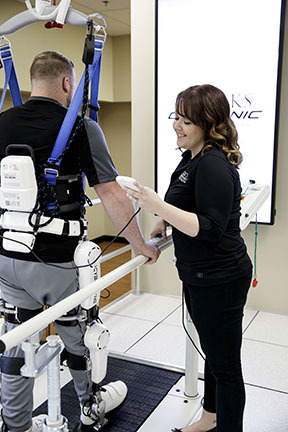 Last year Brooks Rehabilitation in Jacksonville became the first rehabilitation center in the United States to offer the Hybrid Assistive Limb, or HAL, a robotic device designed to help people with spinal cord injury walk independently. Two UF College of Public Health and Health Professions alumni are part of the HAL team: Jessica Dunn, P.T., D.P.T., and Meghan Kettles, P.T., D.P.T., M.H.S. Designed by Japanese company Cyberdyne Inc., HAL acts like an exoskeleton over patients’ lower limbs and is controlled by the patient’s own neurological signals. Dunn, a 2010 graduate of the college’s bachelor’s in health science program, joined other members of the Brooks Cyberdyne team of physical therapists and medical personnel who flew to Tsukuba, Japan, to get hands-on training before the program launched. She chose to work on the HAL team because she believes that health care should take full advantage of advances in technology. With HAL, the integration of human, robotics and information systems allows for more progress to be made than ever before, she said. “It is exciting to be one of the first ones in the United States to introduce this device that is making a difference,” said Dunn, who obtained her doctorate in physical therapy from the University of North Florida. For Dunn, the most crucial aspect of this groundbreaking technology is the ability to help patients become more independent. She also takes pride in developing strong relationships with patients through their three months of daily physical therapy sessions. HAL is fitted over the patient’s waist and is used in conjunction with a body weight support system. HAL is intended to help patients with spinal cord injury who have some motor function of the hip and knee. Typically, in a spinal cord injury, the signals from the brain to the muscle that tell the body to move are disrupted. HAL’s sensors detect faint bio-electric signals from the skin and assist the body to move. There is a rigorous screening process to participate in the program at the Brooks Cybernic Treatment Center. The process starts with an initial screening to determine whether the patient meets all the inclusion requirements; followed by a video conference during which the patient is asked to perform functional tasks, such as transferring or standing up. 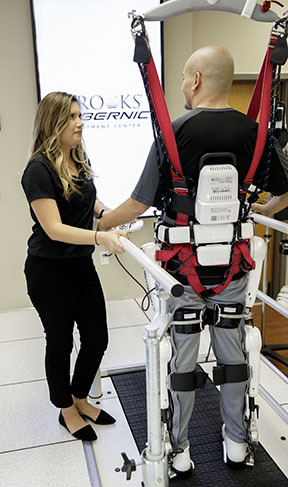 The last step is an in-person medical screen at Brooks Rehabilitation. Meghan Kettles, a 2012 graduate of the college’s Doctor of Physical Therapy program and a 2009 graduate of the Master of Rehabilitation Counseling program, has worked at Brooks Rehabilitation since she started her career. Like Dunn, Kettles emphasizes the importance of building strong patient relationships. “We get to work with patients from all over the world, from Bolivia to Ireland. It has been an awesome privilege to get to know these people and to be a part of their family for a while,” Kettles said. Kettles highlights the importance of communication and a strong team dynamic in the success of the Brooks Cyberdyne team. The physical therapists work together and are always coming up with innovative ways to make progressions, she said. “Every patient is different in physical therapy and especially in neurorehabilitation. It has been a unique challenge, but it is always interesting, and that is why I wanted to do it,” Kettles said.